Megatrends are driving value opportunities in chemicals and associated/downstream industries. We identified various megatrends relevant to the materials industry, including population dynamics/demographics, societal changes, opening market-geographies, commercial efficiencies, affluence and affordability, resources management and new frontiers. These megatrends are also key drivers to growth for other industries (see Figure 1) with links to chemicals, like automobile manufacturing, agriculture, food, electronics, health and consumer products. New developments in science and technology are creating opportunities for extending chemical industry value chains. Chemical companies can leverage their technology platforms to enter new higher growth segments. For instance, along with being employed for making biofuels, bioplastics and bioprocesses, biotechnology platforms can be leveraged in the health industry for use in diagnostics, monitoring and drug delivery. Nanotechnologies can also serve these areas, as well as new energy technologies (carbon nanotubes for energy transmission, nano-composites for wind turbines, etc. )1 and construction applications (for durable materials, improved insulations, etc.)2. Advanced material technology is being used across all sectors, where greater tolerances, miniaturization and other demanding performance criteria come into play. There are several industries peripheral to chemicals where chemical technologies can translate into strategic advantage, representing growth and margin opportunities. The EBIT margins of the life sciences (28 percent), personal care (13.2 percent) and food (12.0 percent) sectors have all been higher than that of the chemicals (11.7 percent) industry, on average, over the 2006 to 2011 timeframe. 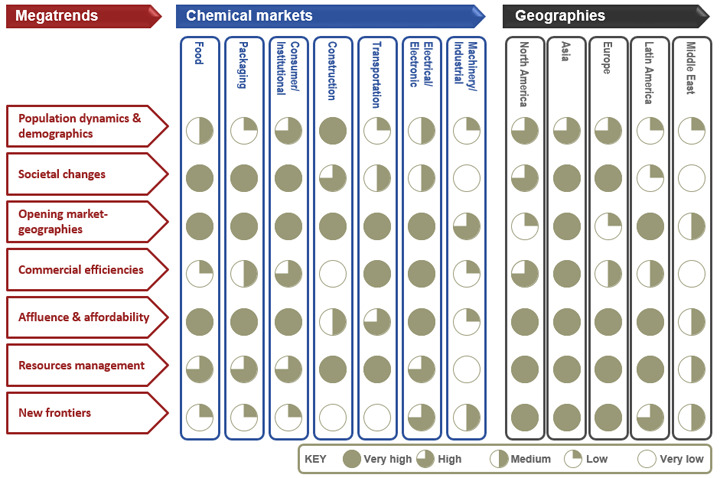 In fact, top chemical companies are leveraging their chemistry platforms to exploit megatrend opportunities in downstream industries through M&A (principally), as well as organic growth (see Figure 2). At the same time, commodities have been declining as a revenue share among top “pure play” (excluding oil majors) chemical companies, as they migrate towards the value-added. 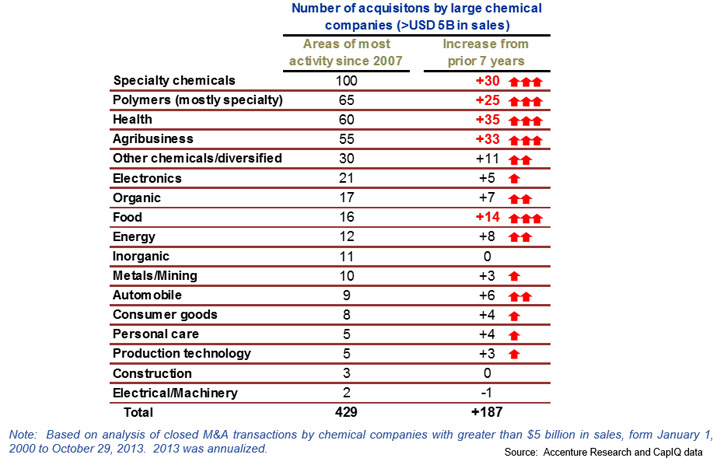 Our analysis of acquisitions in the chemical industry over the past 14 years, worldwide, indicates a strong focus on adding niche technologies and market positions in peripheral industries (See Figure 3). 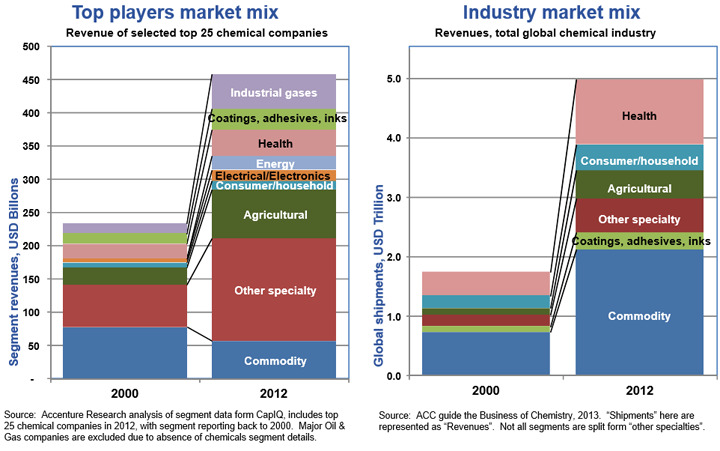 Health, agribusiness and specialty chemicals are of particular focus to chemical majors. These industries typically have unique technologies, services or sales channels associated with them. Electronics growth is linked to consumerism and the widespread acquisition and disposal of electronic consumer goods. Also battery and solar energy technology have boosted electronics growth. Auto manufacturing is high growth due to emerging market consumption, but also increasing value-added chemical use for light weighting and energy efficiency. Specialty polymers represent many types of megatrends, such as meeting the need for aseptic food packaging. Some sectors, like food, do not have as much volume growth as new product and value addition opportunities. Value-added/high growth applications in downstream/peripheral industries have unique business processes and practices. It is clear that the enterprise business models of these industries vary (e.g., as indicated in the large differences in typical SG&A and R&D metrics) and acquisitive chemical producers must be capable of assimilating and integrating unfamiliar business model frameworks. 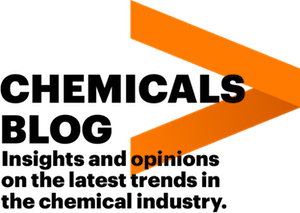 In many cases, these industries are closely connected with consumer markets having unique attributes, where processes and product life cycles are getting faster, companies are racing to meet varying customer needs, brand and quality standards are rising rapidly and differentiation is increasing through innovation and flexibility (driven by automation). Some of these markets are even more global than the chemicals industry (such as food production). According to our research of high performance in these markets, High Performers have systematic approaches for driving performance at speed and strategically manage high value categories, often leveraging partnerships in R&D or in sales channels. Because of this, these markets have been among the first to view IT as a strategic tool, putting social media, analytics, mobility, cloud computing and overall cross-process digitalization at the forefront of development. Based on our extensive research, Figure 4 shows a list of driving forces in the automobile, electronics, food, consumer goods, health and agribusiness market and the relative importance of new IT tools to those sectors. Assessing the expected revenue growth and margin prospects for various M&A targets. 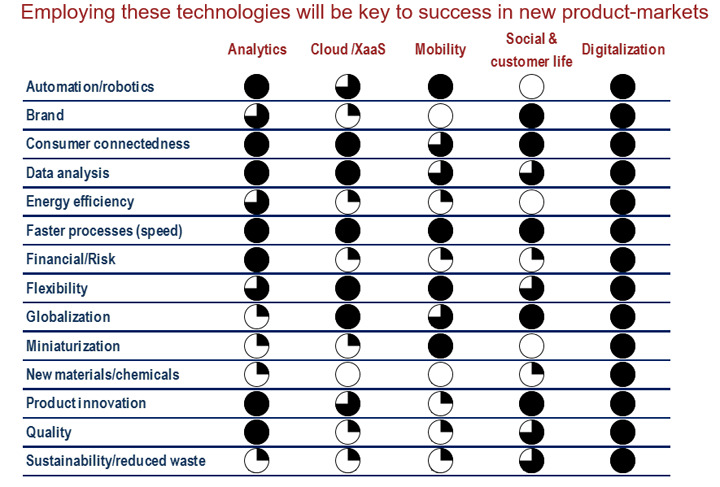 Evaluating the match of technologies and business know-how with potential targets. Gauging existing IT capabilities against target market IT demands, and to what degree your organization will need to adopt and integrate these new/different technologies. 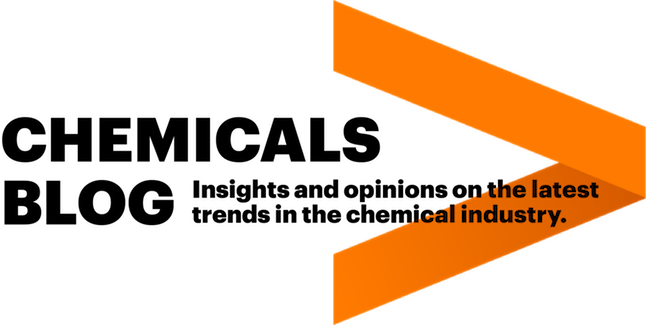 Viewing new business expansions as opportunities for digitalization across the resulting (post M&A) enterprise, where the capture of digitized consumer trends programmatically translates into operational efficiencies through to first order chemical manufacturing inputs, such as creating intelligent chemicals plants, using cloud computing across sites and stakeholders or mobility technologies for maintenance execution. Employing digital pricing excellence, using tools to drive differentiated pricing. Using analytics for sales planning, sales channel management and sales force performance reviews. Achieving marketing excellence through predictive analytics and customer segmentation. Using advanced analytics of supply-demand decision trade-offs, with seamless integration to enterprise resource planning (ERP) and other systems. Engaging with an IT partner that has the breadth of understanding of these issues across industries (we are delighted to help!). As chemical companies grow into new, diverse markets, they will need to use information technologies, more than ever before, as strategic assets. Special thanks to others who assisted in this analysis including Cyronne Counts, Patricia Faust, Gaurav Sharma and Karin Walczyk.